My PenBBS 322 just arrived. This is their new, smaller pen. As you can see from the pictures, it's not that much shorter than the 308 or 309, but it's much slimmer and with a smaller nib (it looks like a #5). It also comes in simpler packaging. The acrylic is nice and clear, and feels fine. Unlike the 308 and 309 (or pens like the the Procolor) there is no cap band which means the threads are visible in this model. In size and feel it is very close to the Pilot 78g and I imagine that it's attempting to offer a similar entry point. This cost me just over £11 including shipping - around $14.50. The star of the show for me is the nib. It's really excellent - a firm EF with some feedback. It feels a bit smoother than the EF #6 nib that they use on the bigger models. As you can see it has a heart shaped breather hole. You could probably eye-dropper this pen, but unlike the other models, it doesn’t come with a rubber o-ring. So you'd have to exercise some caution. At the moment this is only available on the Etsy store, and as a demonstrator. I imagine that this is to test the market a bit. I think this is an interesting new departure for PenBBS. All of their other pens have been based around the #6 nibs, so it will be interesting to see if theyr produce more models using this smaller nib. Personally I find the size a little too small for me. So I'm not sure I'll be buying any more of these, although I'm looking forward to see if they produce them in any of their wonderful acrylics. 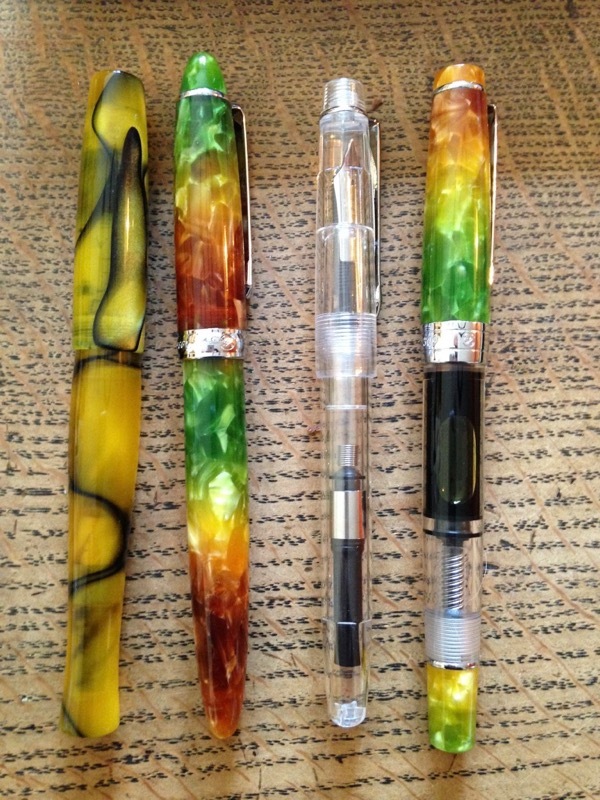 If PenBBS produce a 322 in the Autumn Gradient I will be the first in the queue! That explains why I've never seen this model before, I check the ebay auctions regularly, not the Etsy store. Thank you very much for sharing info about this pen here. I'm still evaluating whether getting a PenBBS since from what I've seen so far the nib and feed's ink flow is inconsistent and drier than what I'd like. The 322 is available on eBay also, but only on the .com site, not .co.uk for some reason. The Autumn gradient on your 308 is gorgeous. I'm eventually hoping for a Dreamland gradient of the 322 and an Autumn in the draft filler (348?) in the far-flung future. But where are your weird cat stickers? It is more expensive to buy off the Etsy store - but dang those stickers! I love mine. Thanks for the review. I've found the PenBBS 308 to be the perfect size for me. If this new one is smaller, I think I'm going to pass on it. How does the EF compared to a Japanese Fine if I may know? Penbbs is a brand I have yet to explore. I hope to do so soon. Nice review, thank you. Thanks for this information. I didn’t know that. I saw this model announced on their Instagram account and the impression I got was that it was the first release of a new PenBBS model. I guess we will have to wait and see if any more are made. 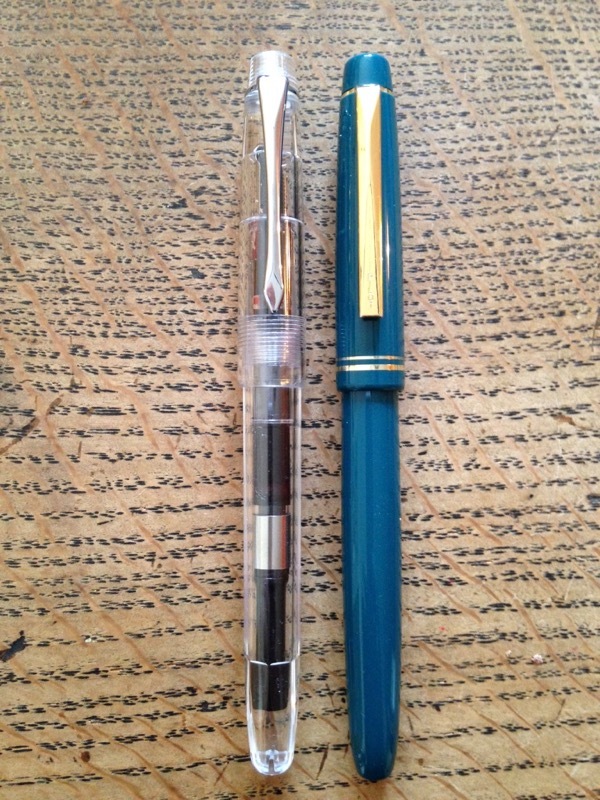 I've compared it to a Platinum SF and a Sailor HF and it seems similar, if not a fraction finer. Not yet! Long posted a picture yesterday in a closed FB group of a prototype PenBBS 456, which is a new vacuum filler pen. It was completely transparent. Beini said that that it wasn't coming out any time soon, but a different new model was. Today, she showed us what appeared to be the new model coming out soon: A double-ended eyedropper pen with a transparent, two-chamber barrel and flecked acrylic sections and caps (no clips or cap bands) on each end. Finally, in response to a question about when "it" was going to be released, Long said next week. I'm assuming he meant the double-ended one and not the 456. But the vacuum-filler project is definitely not abandoned. Tons of innovation coming out of China right now. So it is equivalent more or less with a Japanese Fine as I suspected. Now this is something to look out for. I still don't grasp the design, is it double chambered like in a Visconti type of double chamber? Nothing quite so cool. It's just two separate reservoirs, back to back. Like somebody glued two mini pens together at their end. Italix makes one called the Teacher's Long Pen for marking assignments (black or blue in one side, red on the other for corrections), and I've heard Edison will do them. Now I understand, so basically a pen with nibs on both side. Thanks for the heads up on this. Beini just posted pictures of the new double-ended pen on her Instagram. I've put the screenshots into a new topic. I don’t think it's on sale yet. I did a review on the 322. I have many 308, 309, 269, 349, 350 models. Yes I really like their pens on all levels. 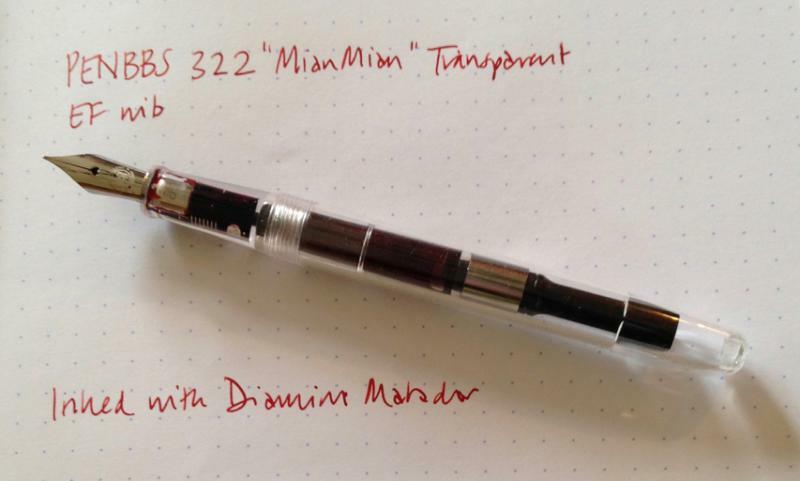 For me the 322 is not a PENBBS pen. 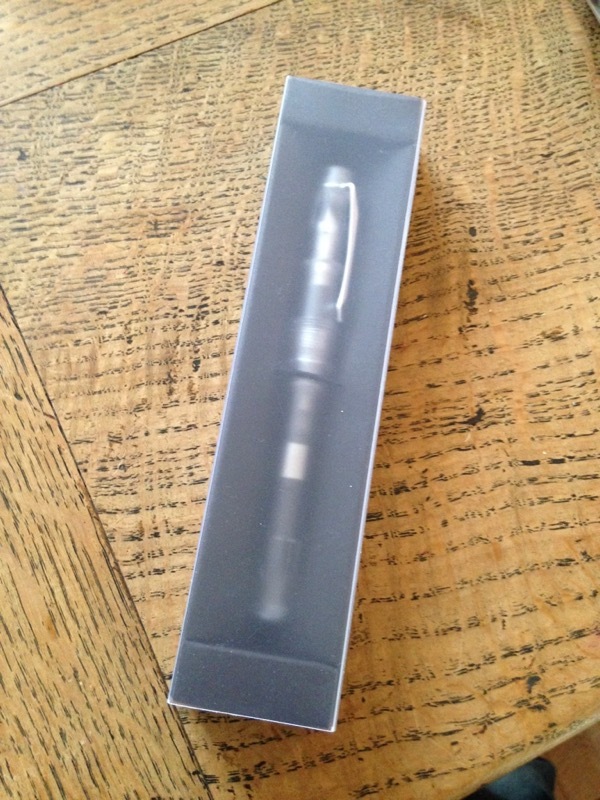 It has a nice nib, slightly better than a 78G but in my eyes it is a 78G, a pen I do not care for. Nothing novel or unique here. PENBBS has raised the bar with other models, the materials they use, the #6 nib. Some interesting designs. But not here. Love your videos Chris, but do you consider the mini line variation of this pen to be a plus? 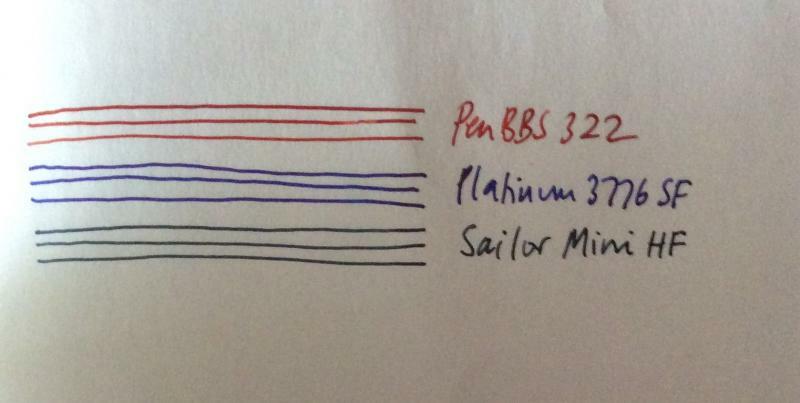 I own a few versions of PenBBS pens (308, 309, 456, 323) along with the 322, and the nib of the 322 is one of my favorites. For me, this nib gives just the right amount of spring and line variation. It's hard to beat, in my estimation. It feels a lot like the EF steel nibs in my Pelikan M205s, and at a fraction of the cost. Almost everytime I order a new model PenBBS pen from Beini on Etsy, I add another 322 in my order. 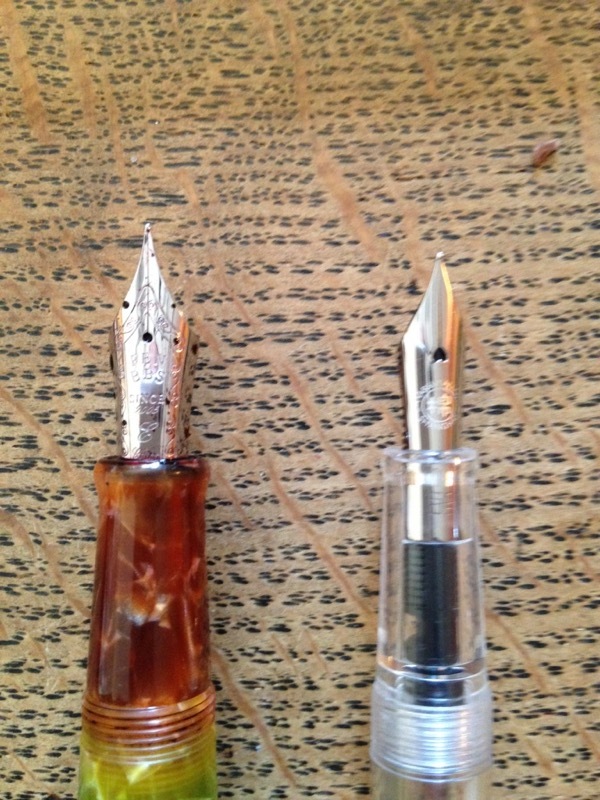 I have not yet tried the fude version of the nib, just the regular EF.